Our exhibition is now hanging on the walls of Perth Scuba. Thirty-two images by WAUPS members showcase the weird and wonderful critters found in our local waters. From nudis and seahorses, to sealions and sharks, the photos are a stunning collection and well worth a look. We reckon we've got some pretty cool critters and photographers over here in Perth, in fact 11 photos in last years Top 100 were taken in our local waters! The first of our weekend talks took place on Saturday afternoon with Joseph Bicanic talking about underwater videography (including the popular Go-Pro) and Karl Fehlauer about shooting with compact cameras. By all accounts, people found the talks very interesting and informative. Many also braved the cold waters on Sunday morning for the first Festival shore dive at the Kwinana grain jetty. There were some excellent critter finds including the not-so-often-seen blue ring octopus. 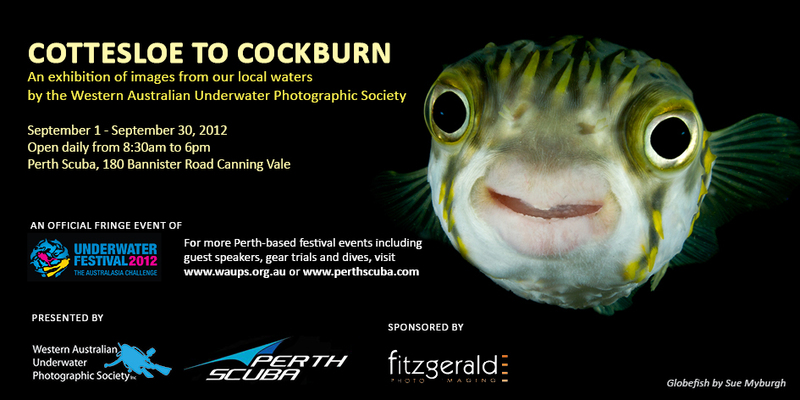 To keep up with all the Perth-based fringe events visit the Festival pages on the WAUPS website or Perth Scuba website. There's something for everyone including gear trials, opportunities for learning, dives, and local photo comps.